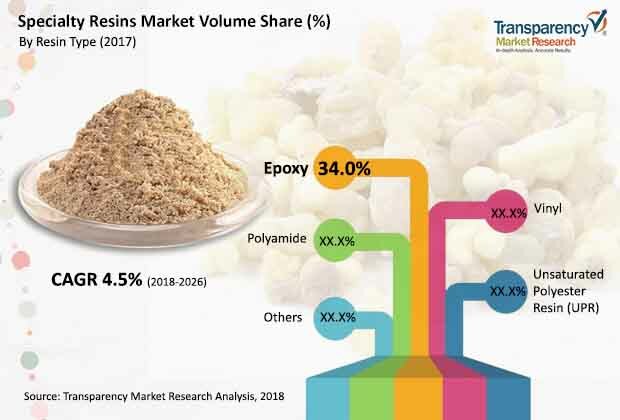 The global specialty resins market was valued at US$ 7,408.75 Mn in 2017 and is anticipated to register a stable CAGR of 5.1% from 2018 to 2026, according to a new report published by Transparency Market Research (TMR) titled “Specialty Resins Market: Global Industry Analysis, Size, Share, Growth, Trends, and Forecast, 2018–2026.” The global specialty resins market is driven by rise in the demand from the building & construction industry. Asia Pacific accounts for a major share of the global specialty resins market, due to increased number of construction activities in the region. Resins are used in a variety of applications, but their usage in the building & construction industry is high. Building & construction is one of the most rapidly expanding industries in Asia Pacific. Usage of specialty resins in adhesives, sealants, and coatings is essential to meet quality requirements of the building & construction sector in Asia Pacific. These resins have high resistance to temperature and excellent chemical resistance. Hence, a large amount of resins are anticipated to be used in the construction of infrastructure projects as well as residential and non-residential buildings in the near future. Improvement in standards of living, rise in the disposable income of consumers, and increase in urbanization are major factors fueling construction activities in Asia Pacific. China accounted for a leading share of the construction sector in Asia Pacific in 2017. It was followed by India. Demand for specialty resins is anticipated to increase in the residential segment of the construction sector in the near future, due to growth in urbanization and rise in population. India is expected to be a rapidly expanding sector for building & construction during the forecast period, owing to rapid development of infrastructure coupled with government support. Countries such as Indonesia, Thailand, and Singapore are estimated to offer significant growth opportunities to the specialty resins market in the next few years, owing to growth of infrastructure and commercial segments of the construction sector in these countries. The automotive industry is undergoing changes in accordance with changes in the consumer taste. The automotive industry relies heavily on coating technologies to protect critical auto components and impart a unique and stylish appearance. These coatings need to provide high performance expected by consumers, while also meeting increasingly stricter regulatory requirements for low VOC emissions. Specialty resins protect metal and plastic components of cars such as chassis and suspension systems from corrosion. Specialty resins are used in car refinishes and OEM coatings as well as matte finishes in automobiles. Specialty resins are employed in high-performance structural adhesives as well as composite resin systems in automobiles. Specialty epoxy resins are used in structural adhesives for assembly and structural composite applications. The global automotive sector is expected to expand at a considerable pace during the forecast period, due to significant increase in the demand for small vehicles and two-wheelers. Thus, rise in the production of automobiles is expected to boost the demand for specialty resins during the forecast period. Bisphenol A (BPA), bisphenol F (BPF), styrene, maleic anhydride, and phthalic anhydride are some of the raw materials employed in the production of specialty resins. The chemical commodities industry has witnessed an upward trend in raw material prices. Specialty resins with higher functionality are often required for further improvement of product performance in challenging applications. Specialty resins are specifically designed for composite, coating, electronic and electric laminating applications. Thus, production of these specialty resins with additional features such as strength and resistance has significantly affected the overall production cost of specialty resins. The increase in prices has become a restraining factor for the specialty resins market, with consumers swaying away due to steep price rise. Specialty epoxy resins is a highly used type of specialty resins and a highly versatile family of resins that are used as binders for coatings, adhesives, sealants, and matrices for composite materials. These products are, in turn, used in several applications such as construction, aerospace, flooring, packaging, electronics, sports & leisure, and household appliances. Specialty resins enhance durability and reliability of products. They are the most used of all specialty resins, due to their better performance. Among regions, Asia Pacific accounted for a major i.e. 48% share of the global specialty resins market in 2017. Growth of building & construction and automotive sectors in Asia Pacific is anticipated to fuel the specialty resins market in the region during the forecast period. Building & construction is a major end-user segment of the specialty resins market in Asia Pacific. This is attributable to rise in construction projects and redevelopment projects for old structures in the region. The specialty resins market in the region is focused on specialty epoxy and vinyl resins, due to their enhanced properties. China is a major manufacturer of specialty resins in the Asia Pacific region. Rising activities related to building and construction in the region is attracting a large number of consumers of specialty resins toward the market in Asia Pacific. Epoxy and vinyl are major product segments of the specialty resins market in Asia Pacific. Key players profiled in the report on the global specialty resins market are DowDuPont, BASF SE, Emerald Performance Materials, Arkema, Huntsman International LLC, Mexichem S.A.B. de C.V., Royal DSM, Aldex Chemical Company Limited, Radiant Color NV, International Speciality Chemicals Ltd, Purolite, Mitsubishi Chemical Corporation, and Thermax Limited. The number of small- and large-scale manufacturers operating in the specialty resins market is high. These companies offer various types of specialty resins such as vinyl, epoxy, polyamides, and UPRs.